Cora Cash is just about as close to royalty as an American can get. Her family isn’t old money, but they’re wealthy enough to be the talk of the town – and own a mansion in Newport that makes the Vanderbilt estate look miniscule. Even so, Cora’s mother is always looking for the next step to improve her family’s standing, and she’s fairly sure she has found it in Europe: a title. Rich American girls are all the rage among Europe’s cash-strapped gentry, to the point where there is actually a publication in the States listing those titled men looking hardest for an heiress. After all, who but a duke could be worthy of the Cash family’s only child? Luckily for Mrs. Cash’s plans, the Duke of Wareham happens upon Cora when she is injured in the woods while riding, and before long the two are engaged. It isn’t long, though, until Cora discovers that she is not quite as prepared for this life as she believes herself to be. 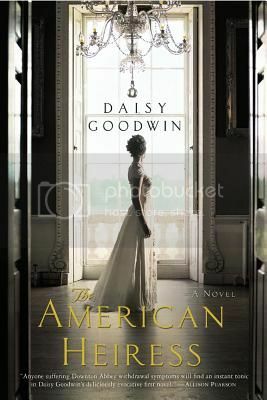 Daisy Goodwin’s American Heiress is a fun and engaging read. Nobody is particularly likable – the closest is Cora’s maid Bertha, Cora herself is quite spoiled – but Goodwin still manages to evoke some empathy for those characters who find themselves in situations they don’t entirely understand. The time period was believable, as was the fairly dramatic plot, both of which contributed to the cotton candy can’t-stop-reading aspect. At close to 500 pages, though, it was just too long. Considering it was much more plot-driven than character-driven, not enough happened to justify that length of book. Quite a bit could have been cut down to create a tighter story. American Heiress is a flawed but interesting novel. Certainly the concept of Gilded Age American heiresses infusing a generation of British nobility with money is a fascinating – and true – one. The American Heiress is the SheKnows Book Club pick for May. Source: Publisher, for the SheKnows Book Club. Sounds interesting… I have this one one but have not read it ….yet. I had a great time with this one last year — it was a perfect beach read! I have this one on my Kindle…need to pull it up and get busy! I like the sound of the plot, but I’m kind of put off to hear that none of the characters were very likeable. Characters totally make or break a novel for me. I’ve always been interested in the American Gilded Age (probably why the new Gatsby film has me so excited)… but 500 pages seems really long. Can’t help thinking that Daisy Miller by Henry James was only 64 pages.